The Chiefs have scored 140 points off turnovers this season. KANSAS CITY, Mo. — They’re given the somewhat ambiguous title "miscellaneous points" by the Kansas City Chiefs, though coach Andy Reid is quick to point out that they count just the same. Kansas City has a league-leading 11 touchdowns from defense and special teams with two games still to play in the regular season. That’s the third-most touchdowns in NFL history, and a level that has been achieved just eight other times — three of those also by the Chiefs. "Sudden change and getting into the end zone, any time you get points is a good thing. It helps you win games," safety Eric Berry said. "That’s just our mentality every week, just coming in here and trying to score points however we can." "That’s what the coaches have been talking about every week," linebacker Derrick Johnson said, "when the offense isn’t on the defense has to be on. This is a team deal." Five times the Chiefs have picked off a pass and returned it for a score — Berry has two, but Tamba Hali, Sean Smith and Husain Abdullah also have done it. Hali also has a fumble return for a touchdown on defense, and Marcus Cooper has one on punt coverage. 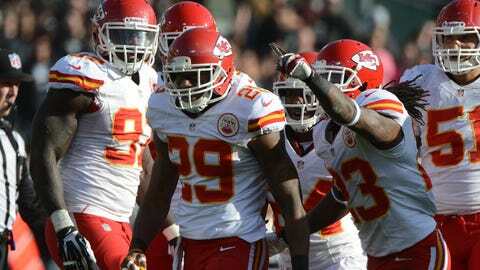 Then there’s the two punt return TDs by McCluster, and the kickoff return touchdowns by Quintin Demps and Knile Davis. "You’re not satisfied with just getting the ball. You want to score," Sutton said. "It’s really like setting up a punt return. We’re going to try to get the ball to the nearest sideline, all the other defenders are going to set up a wall, and the most dangerous guys to account for are the intended receiver, because he’s behind, and the quarterback, because he’s the last player." It’s become so common that the Chiefs score on defense and special teams that it’s more notable when they come up short. Asked what went haywire last week against Oakland, when Kansas City merely had a 50-yard kickoff return but didn’t score, special teams coach Dave Toub glibly replied: "Yeah, we kind of let the team down." "I’m not sure you count on them as much as you strive to get them," Reid said. "In this business you don’t count on anything, you go out and work to earn the right to get yourself in that end zone. Likewise with your turnovers, I mean, it’s the same mentality at all of the positions. We don’t count on that, we just work on it and we have high expectations for it." Notes: The Chiefs released WR Chad Hall and re-signed DT Jerrell Powe on Thursday. That means that McCluster, who’s been out with an infection in his ankle, should be available Sunday against Indianapolis. "I feel good," McCluster said. "I’m ready to be out there."